Two days after Grand Theft Auto 5 launched for the PC, someone has figured out how to make it work with the Oculus Rift. The results, as seen in this video of a high-speed crotch-rocket ride through Los Santos, are nothing short of spectacular. The VR functionality was enabled by vorpX, which "lets you play many existing DirectX9-11 games on your Oculus Rift in stereo 3D." 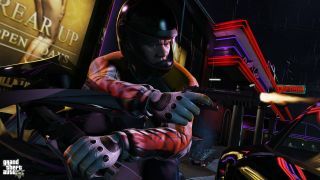 There's not a whole lot going on here in terms of gameplay—creator Falandorn says he's "not really into missions and all that, just speeding about shooting people and causing carnage is entertainment enough"—but even as just a sight-seeing tour, it's a blast. And the great thing is, this is just two days after launch—this kind of thing is only going to get better.